I had some business to attend to in Tel Aviv, an no, it was not related to photography. The good thing, as you will see, is that I never leave without my cameras. The guy I was supposed to meet on tuesday forgot to tell me about the elections so around 11 am on that day I realized I’ve got nothing to do in Tel Aviv for the next 24 hours. I decided to drive to Jerusalem and spend the day walking in the old city. I got there precisely at 1 pm. While having lunch on the terrace of my favorite place in Jerusalem I decided to give it a shot and try to get in at the event organized by Likud Party in Tel Aviv, late that night in expectation of the first exit pols televised results. The last 2 days of my stay I wanted to spend in Gaza. Friday morning I woke at 5 am and took a taxi to Israeli-Gaza border. I got there around 7 am so I had to wait another hour for the border to open, but only to be denied entry. I couldn’t get my GPO on friday for all governmental institutions are closed so I knew this might happen. I needed to go to Jerusalem, my fall back option but there was no taxi in site. While approaching the parking lot a Palestinian driver came to me and offered his services. I didn’t had the chance to say yes when another driver came and asked me to consider him for the ride, provided that he was the first driver in line…In a split second shouting erupted and punches started flying around. For a moment I found this really amusing but I could not think that we will end up gunned down by the not so easily amused Israeli border patrol. A third palestinian driver came and put an end to the fight. By the rush the two fighters got into their cars and drove away. I can only assume the fight was to be continued someplace else, where there wasn’t such a big risk to be interrupted by a few hours or days inside an Israeli prison. I was in front of a Palestinian pottery shop talking to the owner about politics when I first saw them. It was precisely 10.17 pm. I know that because even though I was caught in the debate I managed to turn in the last second and snap a picture of them as they where entering the shop. ‘Life is not always fair’, my last word before pressing the release shutter echoed on the already empty streets of the old city. This interesting character, who’s wife just entered the shop, stopped outside and added ‘Life is never fair’. He introduced himself as Robert from New York and to my surprise he was born in Romania some more than 50 years back. At 3 am they where supposed to go to the airport. Robert had to be back in New York on Monday. What followed was an amazing 3 hours that I will never forget. This is what living life at full is all about. Robert is fluent in hebrew and he spent many years in Israel as a teenager. Skinny, with long hair and cool accessories you could easily think he is a singer in a rock band. You would never have guessed that he is a layer, heading back to New York to plead in front of the Supreme Court. On top of that he is a scholar, a teacher of law at the University of Columbia in New York. Cindy, with a worm smile she looked half her age. I couldn’t believe my years when they said she is 58 and they have 5 kids, all grownup, in charge of their own life. They are now what I would call ‘independent’ parents out to experience the world and live a life full of adventures. First they took me to the western Wall. Robert wanted to say a last pray before his big case on Monday. We where still trying to get to know each other when Robert had this idea to take me to a hostel run by 6 palestinian brothers. It took us some time to find it but when I saw it I realized my meeting with Robert and Cindy was not a coincidence but an act of fate. It was the same hostel, whose sign I was photographing a few hours earlier. It was a huge hostel but not very populated. The business was slow. We went to the first floor. In a big room it was Ramadan. Overweighed, with a bottle of whisky and few bottles of beer next to him, he was dominating the room. Before I had the chance to realize what it was happening to me, one of the brothers told us the reason muslims can have more than one wife and he asked us what Jesus had to eat for the last supper. I replayed ‘it wasn’t cheeseburgers for sure’. Except for Robert and Cindy nobody seamed to ‘taste’ my joke. I continued ‘whatever He had, I wouldn’t recommended to anyone else, knowing what happened immediately after’. By looking at them I realized humor was a stranger in that house so I decided to keep my mouth shut. Beside us and the 3 brother in the room it was another person. Haya, was a guest in the hotel. She was from Mali and she was of jewish origins. According to her, she came to Israel to learn Hebrew. Yet, she was living in the arab quarter of Jerusalem in a hostel run by 6 borderline fanatic muslims. When she started to talk I felt like I was in Twin Peaks. “People often ask me if I am a man…I don’t understand why we need to label people – man or woman…I am poor…I’ve got nothing, no money, nothing…I have no worries, I am so relaxed”. Shyly I tried ‘as long as you have your health, you’ve got everything’. “I don’t have that either, but I am such a relaxed person.” Just for opening my moth she wiped the floor with me. Her ranting left me mesmerized. I believe that if she would have a bomb vest strapped to her chest she would have detonate herself there and then. We left the place laughing our hearts out. It was strange to hear our laughter echoing on the empty streets of the old city. Jerusalem is the craziest place on earth but I don’t remember hearing people laughing loudly on the streets. It’s like true happiness can not be expressed in that particular place. You can cry as loud as you can but anything above a smile and a giggle is frown upon. We tried to get something to eat but the kitchen of the old hotel Jerusalem was already closed. We walked for a while on the streets of East Jerusalem, somewhere in the vicinity of the American Consulate and we reached the place where Rober and Cindy where staying. They had a room inside the Anglican Church. It was really cosy and I remembered visiting that place 15 years back. We took their car and went for a quick late dinner near Jaffa Street. We had a great time sharing and bonding. We discovered many things in common. Little after 1 am we had to conclude our conversation for Robert and Cindy where supposed to catch an airplane in a few hours. We said our goodbyes hopping to meet again sometime. 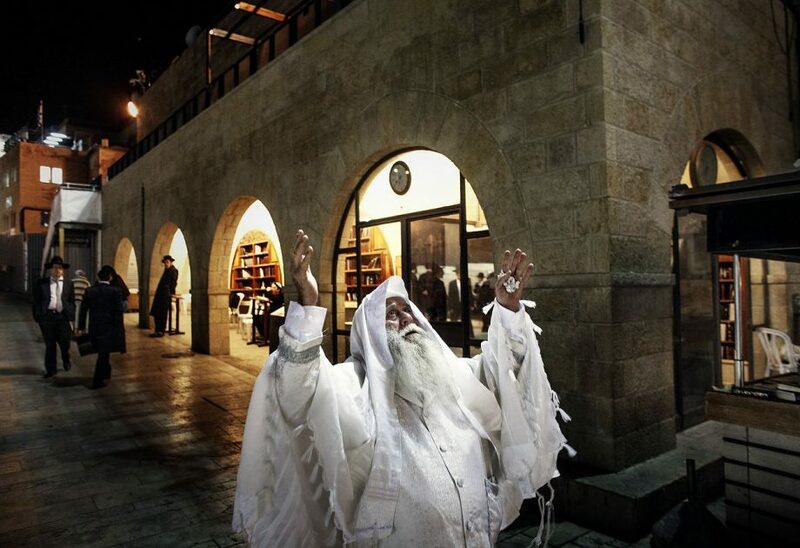 Jewish men pray at the Western Wall in the Old City of Jerusalem, on January 26, 2013. 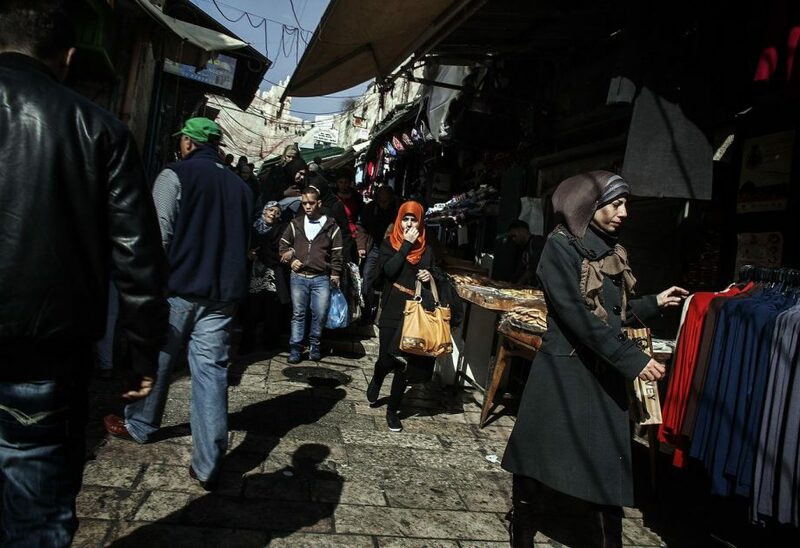 Palestinians seen near Damascus Gate in the Old City of Jerusalem, on January 26, 2013. 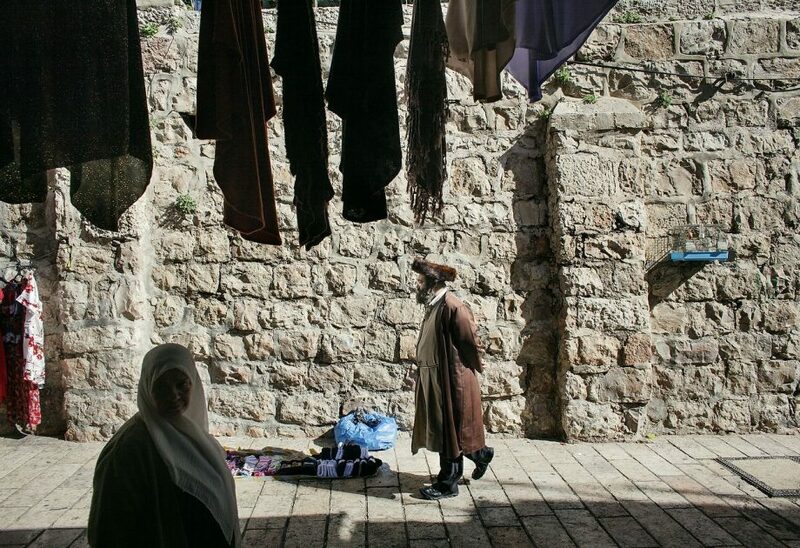 Ultra Orthodox jewish men walks by in the Old City of Jerusalem, on January 26, 2013.